Citations are mentions of your business online that occur off of your website. This is not a backlink to your website, but a webpage on another site that lists your NAP (name, address, phone) information. 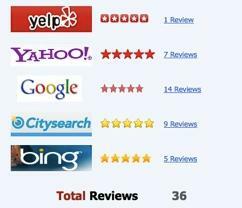 Some examples include yelp.com, manta.com, kudzu.com and merchantcircle.com. Search engines like Google use citations to validate that a business exists at a particular location. Businesses with lots of citations rank higher than those with a lower volume. Of course, there are several other factors but this one is pretty important. If your competition has more citations, you need to catch up or get ahead. In every industry, there are standard sites that a search engine would expect your business to be listed in order to prove relevancy. It’s worth taking the time to claim and verify your listings on high value citation websites to not only help with search engine optimization, but with overall reach. The more listings your business has, the more referral traffic to your website. Filed under: Analytics, Business Strategy, Digital Marketing, SEO.